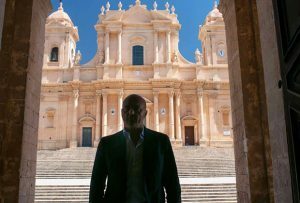 This guide has been created for those who want to know what to do and see in the land of Sicilian Baroque and in the places of Inspector Montalbano. 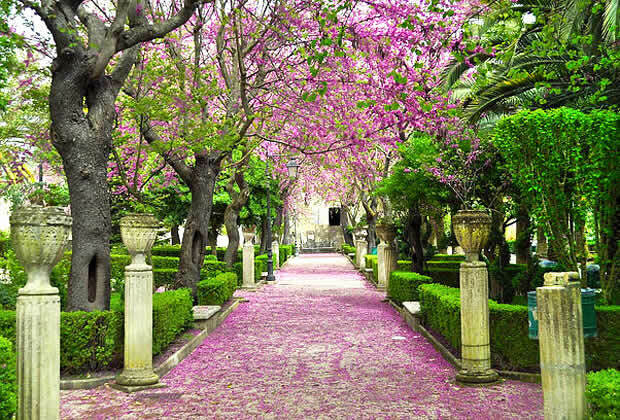 A wonderful city of art in the south-eastern part of Sicily, Ragusa has ancient origins, but its fame derives in particular from its several Sicilian Baroque monuments, built in the city after the 1693 violent earthquake of the Val di Noto. Reconstruction divided the city in two parts: on the hill Ragusa Superiore (or Ragusa Alta) was built, while on the ruins of the ancient medieval village Ragusa Ibla was constructed. Part of a UNESCO World Heritage Site, Ragusa is also known as "the island within the island" and, besides its architectural masterpieces, it possesses places and views of striking beauty. Many of these have been used as the setting of the famous TV series "Inspector Montalbano", taken from the literary works of the Sicilian writer Andrea Camilleri. In order to better know Ragusa and grasp its essence, we would like to accompany you on an ideal tour, to discover its main attractions and places to visit. The historical centre of Ragusa Ibla is the point of reference of the city and it is also its most evocative quarter, thanks to its many palaces and churches. Starting from Piazza Pola, where the San Giuseppe Church is located, you can take Orfanotrofio road for a nice walk through its typical back-streets. Along the way, you can find many cafés and restaurants and you can also admire the beauty of the palaces that line the roads. 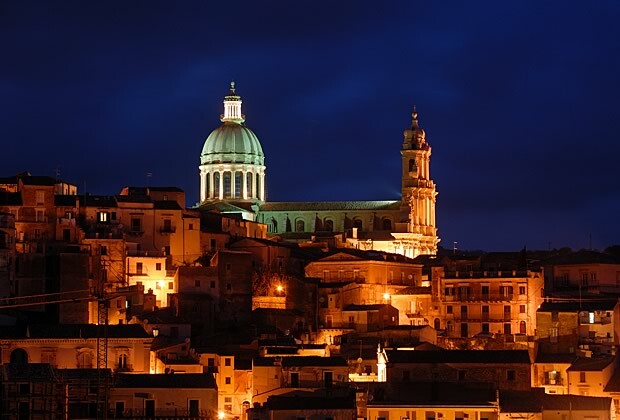 Heading up to Corso XXV Aprile, you reach the Duomo of San Giorgio, a symbol of Ragusa Ibla. The church was built after the above-mentioned earthquake, on the ruins of the Church of San Nicola and in the same quarter that hosted a church dedicated to Saint George, dating back to the 12th century. Definitely one the most suggestive works and one of the best examples of Sicilian Baroque, the Duomo overlooks the square of the same name, with its irregular shape and the unmistakable Neoclassical dome added in 1820 and inspired by the Pantheon in Paris. In the lower part of the square you can appreciate the fountain opposite Palazzo Arezzo di Trifiletti. If you are looking for a Hotel in Ragusa, we suggest you choose from Hotels.com. There are good facilities with convenient prices, photos and reviews of people who stayed there before you. 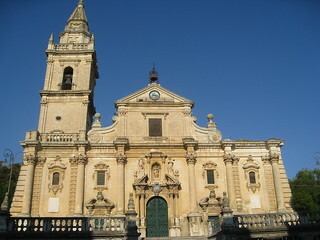 The Portal of San Giorgio, which is the only element of the Church of San Giorgio that was not destroyed by the 1693 earthquake, is another important symbol of Ragusa. 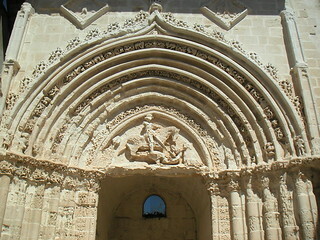 The lancet arc in Catalan-Gothic style is decorated with the figure of Saint George on a horse killing a dragon, while on the upper part you can find the Aragon eagle. Near the Portal, you can find the Hyblean Gardens (photos), which we suggest you visit for a regenerating stop after the long walks through the historical centre. Inside this green oasis there are the Church of San Vincenzo Ferreri, the Church of San Giacomo and the Church of Cappuccini. On the other side of Ibla, there is Piazza della Repubblica, crossroads of ancient alleys where you can find the Church of the Anime Sante del Purgatorio, very close to Cosentini Palace. Built at the end of the 1700s, this palace is characterized by particular mascarons located under the balconies and which reflect one of the main peculiarities of the Baroque culture. 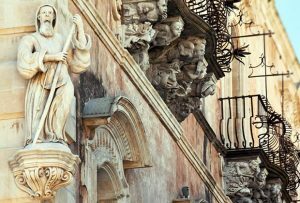 Cosentini Palace is a great tourist attraction and it stands out for the contrast of the grotesque figures under the balconies surmounted by musicians and storytellers, creating an almost harmonious connection. Next to the palace, the Salita Commendatore is located, leading shortly to the Church of Santa Maria dell'Itria with its typical blue dome. Moving towards the western part of the city, you reach Ragusa Superiore, with its church dedicated to Saint John the Baptist, co-patron of the city with Saint George. Built at the beginning of the 18th century after the earthquake, the Cathedral of San Giovanni Battista is striking because of its typically Baroque monumental façade. You can admire the sculptures that decorate the tympanum over the central portal, on the upper part there are two sun clocks, while on the left stands out a 50-metre bell-tower. The interior of the Cathedral is also of great importance, enriched with decorations of rare artistic beauty. The Cathedral is higher with respect to the square it faces, outside you can find a small, well-kept garden, while on its side, on Corso Italia, you can visit the Collegio di Maria SS. Addolorata built in 1796. 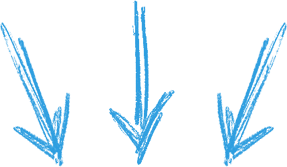 Can you help us to show it to your friends? 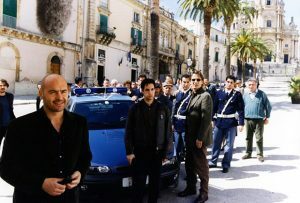 The Inspector Montalbano TV series is set in Vigàta, in the province of Montelusa, both imaginary Sicilian cities invented by the writer Andrea Camilleri. In order to represent Vigata in its film version, many Sicilian locations have been used, especially in the province of Ragusa. In the TV series you can recognize the square in Ragusa with the Duomo of San Giorgio and the Church of Santa Maria delle Scale, which offers a breathtaking view on the Ibla quarter. You can also identify other parts of the city such as the Ponte Vecchio, Piazza Pola and the Church of San Giuseppe, the Hyblean Garden, the Square with the Cathedral of San Giovanni, and also the club "Circolo di Conversazione" that Montalbano visits for his investigations, bothering ("rompere i cabbasisi", in Sicilian dialect) doctor Pasquano while he is playing poker. 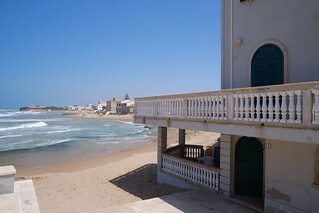 Inspector Montalbano’s famous house is located in Punta Secca, a hamlet of the municipality of Santa Croce Camerina, which represents, along with the Donnalucata seaside, the town of Marinella in the popular TV series. The house is located in a small square, in front of Scalambri Tower, dating back to the 16th century. With its 35-metre lighthouse, this seafaring village is undoubtedly one of the most beautiful costal locations in the province of Ragusa, and Montalbano’s house has become a tourist attraction for many visitors. Donnafugata Castle, a wonderful noble residence surrounded greenery, is 15 kilometres far from the city of Ragusa. The palace has a typical Neo-Gothic façade and in the Montalbano series it is the house of Mafia godfather Balduccio Sinagra. In some scenes shot inside the castle, you can see its marvellous decorations and luxury furniture. Going up to the terrace you can recognize perfectly the balcony where the meeting between Montalbano and the old godfather took place. You can admire the breathtaking view and the garden which includes the labyrinth, also part of the TV series. The castle dates back to the late 1800s and has an area of 2,500 square metres, it has 122 rooms, but only twenty can be visited by paying an entrance ticket. 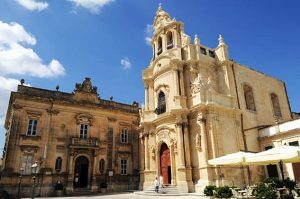 - known as the "capital of Baroque", the city of Noto is also part of some episodes of the TV series. It is located in the province of Syracuse. - the seaside resort of Marina di Ragusa, with its well-appreciated Seaside. - Ispica with its Basilica di Santa Maria Maggiore and its wonderful beach of Punta Ciriga. - Modica, well-known for its Chocolate and Sicilian Baroque. - Comiso with its Church of Santa Maria delle Stelle. - Vittoria known for its Cerasuolo wine, but also for its beach and the seafaring village of Scoglitti. - Scicli, another fascinating baroque town worth seeing. Near Scicli, in the city quarter Pisciotto of the Samperi hamlet, you can find the ruins of a former brick-factory called Fornace Penna. 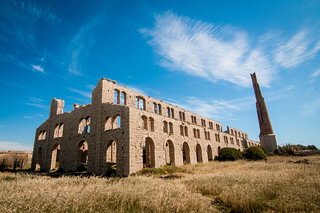 The factory was almost destroyed after a fire, but it was the ideal location to reproduce La Mànnara in some episodes of detective Montalbano stories. This place is isolated and not easily accessible, however it is very suggestive and it has an excellent position in front of the sea. We hope we helped you in the discovery of the breathtaking places that this part of Sicily offers. If you found this guide useful, please leave a comment to share your opinions, experiences and suggestions.